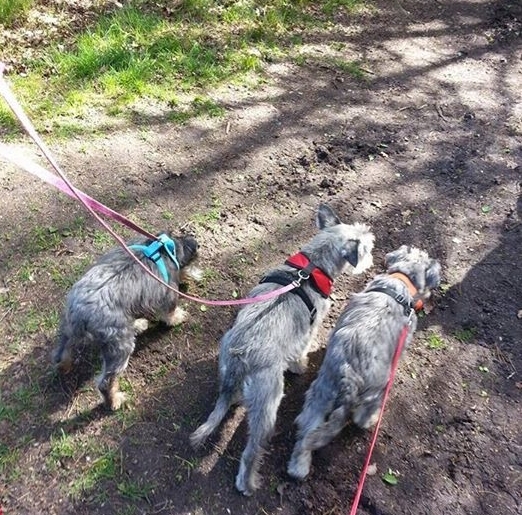 On a chilly day late in 2013, two elderly miniature schnauzer sisters were dropped off at DBARC by a person who could no longer take care of them. She had a new baby, the weather was wet, the days were short and walks were too hard to manage. One of the dogs had started having accidents in the house. The sisters had been with her for about a year, having previously been in a foster home (not via DBARC) for well over a year waiting for their “forever” home to be found. Sad that the “forever” home wasn’t really forever, but happily this time, the sisters had found real safety and genuine love embodied in the DBARC team. Shortly after arriving at DBARC, it became clear that one of the sisters was not a very well girl at all, something her previous owner had perhaps forgotten to mention in her need to leave the dogs somewhere. Not that it would have deterred DBARC from taking the girls in to their caring embrace, but it might have saved the poorly girl from some pain if they had known straight away and veterinary care could have been quicikly arranged. In fact she was seriously unwell, and off to the vet she was taken. To cut a very long story short, it was found that she had serious liver disease. Such sad, awful news but the DBARC team did all they could to make her time with them comfortable and suffused with love, so that she would pass away having enjoyed abundant tenderness and human kindness whilst with them. 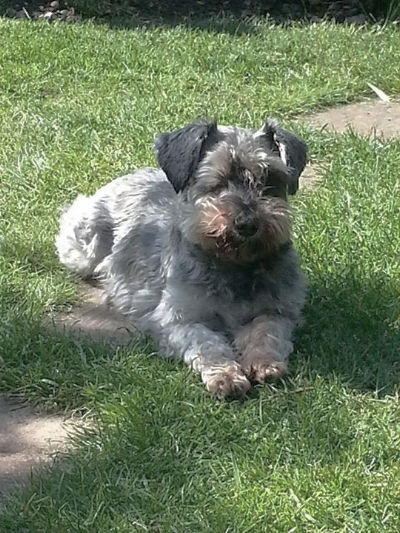 The veterinary treatment that this little miniature schnauzer was provided with, ensured she was comfortable to the end. DBARC didn’t hesitate to arrange for and fund this care. That left behind her bereaved sister. They had been inseparable companions, been through the trauma of losing their once loving home at the death of their owner, staying for so long in foster care, finding themselves in their new home, only to be pitched out of that at a stage in their lives when love, stability and veterinary help was most needed. Through all the time at DBARC, this little girl behaved beautifully, lovingly, and was soon adored by all who met her. But she too had health issues, which would mean a very special home would need to be found for her. Finding homes for elderly dogs is never easy but DBARC were undaunted. Through DBARC she had her health issues sorted out with correct veterinary care, including the removal of one of her eyes. And then her home had to be found. It was a very special home that would be good enough for this girl to go to. This time, it had to be really and truly her forever home. DBARC would not risk sending her to anywhere less than the perfect home. And it was found. Today, Princess Pippa lives happily ever after with Carol, dedicated volunteer at DBARC and her two miniature schnauzers: Fifi who had cataract surgery funded by DBARC and Gemma, both survivors of the puppy farming business. This is what the team at DBARC does, all year round for the animals in their care. They love them as dearly as if they were their own. This is what Schnauzerfest is raising money for. Join us to celebrate with your schnauzers.